Collard greens, also referred to as collards, are a member of the cruciferous vegetable genus Brassica, which is rich in cancer fighters diindolylmethane and sulforaphane, as well as fiber. Collard greens provide antioxidant vitamins A, C, and E; vitamin K and niacin; and carotenoids, including a substantial amount of lutein. They are also a good source of zinc, manganese, calcium, and magnesium. Collard greens are among a small number of foods that contain measurable amounts of oxalates, so over-consumption can cause problems for those with kidney disease, gout, vulvar pain, rheumatoid arthritis, or other conditions that may require a low-oxalate diet. One cup of chopped and boiled collards provides 35 calories, 7.8 g carbohydrate, 1.7 g protein, 0.2 g fat, 3.6 g dietary fiber, 3491 IU vitamin A, 15 mg vitamin C, 0.4 mg niacin, 8 mcg folic acid, 168 mg potassium, 20 mg sodium, 10 mg phosphorus, 29 mg calcium, 9 mg magnesium, and 0.20 mg iron. Cucumbers are more than 95 percent water and nearly 4 percent carbohydrate by weight. They provide vitamins A, C, and K; folate and other B vitamins; carotenes; and the minerals calcium, potassium, and magnesium. They are an excellent hot weather snack, because they provide both water and electrolytes to help with hydration and blood pressure. The compound that makes cucumber slices a kitchen remedy for puffy eyes is believed to be caffeic acid. Found in many plants, it is especially accessible in cucumbers and has been shown to be an antioxidant. It has also shown potential to inhibit the growth of cancer cells in laboratory studies. One cup of raw cucumber slices, with the peel, provides 16 calories, 3.8 g carbohydrate, 0.7 g protein, 0.1 g fat, 0.5 g dietary fiber, 109 IU vitamin A, 3 mg vitamin C, 7 mcg folic acid, 153 mg potassium, 25 mg phosphorus, 17 mg calcium, and 14 mg magnesium. 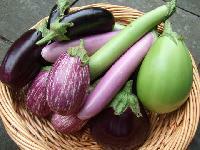 Eggplant is a very good source of dietary fiber, potassium, manganese, copper, and thiamine (vitamin B1). It is also a good source of vitamin B6, folate, magnesium, and niacin. Although eggplant got its name from varieties that were white or yellow in color, the most common eggplant in North American cuisine is purple. That rich purple skin is the source of an interesting anthocyanin called nasunin. Nasunin has antioxidant properties, is a scavenger of free radicals, and has been shown in the laboratory to protect cell membranes, including brain cells, from oxidative damage. Another eggplant nutrient, chlorogenic acid, is an antioxidant and works to slow the release of glucose into the bloodstream after eating. In fact, it�s sold in some countries as a weight-loss supplement. Eggplant is among a small number of foods that contain measurable amounts of oxalates, so over-consumption can cause problems for those with kidney disease, gout, vulvar pain, rheumatoid arthritis, or other conditions that may require a lowoxalate diet. One-half cup of boiled eggplant provides 13 calories, 3.2 g carbohydrate, 0.4 g protein, 0.1 g fat, 1.2 g dietary fiber, 31 IU vitamin A, 1 mg vitamin C, 7 mcg folic acid, 119 mg potassium, 11 mg phosphorus, 3 mg calcium, and 6 mg magnesium. Green beans are low in calories, high in fiber, and full of nutrients. They provide antioxidant vitamins A and C, as well as vitamin K and the B vitamins thiamine, niacin, riboflavin, and folate. Minerals found in green beans include manganese, potassium, iron, calcium, copper, and phosphorus. This wealth of nutrients gives green beans great potential in preventing cancers, heart disease, and other illnesses in which inflammation plays a role. Green beans are, however, another food that has measurable amounts of oxalates, so over-consumption can cause problems for those with kidney disease, gout, vulvar pain, rheumatoid arthritis, or other conditions that may require a lowoxalate diet. One-half cup of boiled green beans provides 22 calories, 4.9 g carbohydrate, 1.2 g protein, 0.2 g fat, 2 g dietary fiber, 413 IU vitamin A, 6 mg vitamin C, 21 mcg folic acid, 185 mg potassium, 2 mg sodium, 24 mg phosphorus, 29 mg calcium, and 16 mg magnesium. What makes hot peppers hot is a group of six acids called capsaicinoids, primarily capsaicin. These compounds likely evolved because they discourage animals from eating the peppers and act as anti-fungal agents. But they have such a powerful and unique effect on the nerves and tissues of mammals, including humans, that they are being studied for a variety of possible health benefits. Both in the laboratory and in animal studies, capsaicin has been shown to kill prostate cancer cells and to inhibit the onset of tumor growth and cell mutations that might lead to cancer. Some studies have also suggested that capsaicin may have a role to play in curbing obesity and treating type 1 diabetes, because it appears to reduce the amount of insulin needed to lower blood sugar after a meal. It also appears to inhibit the growth of Helicobacter pylori, the bacterium that causes 80 percent of stomach ulcers. Because of its profound effect on nerves, it is used in a variety of pain-relief therapies. And because it acts on Substance P, which is involved in the body�s inflammatory response, it may turn out to be a strong anti-inflammatory. Studies have shown that countries where the cuisine includes a lot of hot pepper have lower rates of heart disease and stroke. Hot peppers are also high in vitamins A and C, the B vitamins (especially B6), and the minerals potassium, magnesium, and iron. One raw hot chili pepper provides 18 calories, 4.3 g carbohydrate, 0.9 g protein, 0.1 g fat, 0.7 g dietary fiber, 347 IU vitamin A, 109 mg vitamin C, 11 mcg folic acid, 153 mg potassium, 3 mg sodium, 21 mg phosphorus, 8 mg calcium, 11 mg magnesium, and 0.14 mg zinc. Jicama is mostly water. It is a good source of dietary fiber, potassium, and vitamin C. It also contains inulin, which is partly responsible for its sweet taste. In addition, inulin increases the absorption of calcium, and possibly of magnesium. Combined with the fiber and water found in jicama, these nutrients help both hydration and blood pressure. Although it is a sweet-tasting source of fiber, it does not appear to raise blood sugar or triglyceride levels. Three and one-half ounces of raw jicama provides 46 calories, 10.6 g carbohydrate, 0.86 g protein, 0.11 g fat, 5.8 g dietary fiber, 19 IU vitamin A, 24 mg vitamin C, 8 mcg folic acid, 135 mg potassium, 4 mg sodium, 16 mg phosphorus, 11 mg calcium, and 11 mg magnesium. Kale is a leafy member of the Brassica genus. As a dark, green leafy vegetable, it is rich in vitamin K. In addition to the Benefits typical of the cruciferous vegetables, kale also provides a flavonoid called kaempferol that appears to reduce the risk of heart disease. In one 8-year study, kaempferol, in combination with the flavonoids quercetin and myricetin, reduced the risk of pancreatic cancer by 23 percent. Kale is rich in the antioxidant vitamins A and C, as well as several carotenoids, including beta-carotene, lutein, and zeaxanthin. These compounds help protect vision and lower the risk of cataracts and age-related macular degeneration. It is also a good source of B vitamins, including thiamine, riboflavin, and B6, and the minerals calcium and iron. Kale is one of a small number of foods that contain measurable amounts of oxalates, so over-consumption can cause problems for those with kidney disease, gout, vulvar pain, rheumatoid arthritis, or other conditions that may require a lowoxalate diet. One-half cup of cooked, chopped kale provides 21 calories, 3.7 g carbohydrate, 1.2 g protein, 0.3 g fat, 1.3 g dietary fiber, 4810 IU vitamin A, 27 mg vitamin C, 9 mcg folic acid, 148 mg potassium, 15 mg sodium, 18 mg phosphorus, 47 mg calcium, and 12 mg magnesium. Kelp is included here as an example of the �sea vegetables��oceanic plants that are eaten in many parts of the world, from Ireland and the Canadian Maritimes to Japan and Korea. They are especially rich in minerals, including calcium, iodine, iron, magnesium, and trace minerals. They also contain vitamin A. 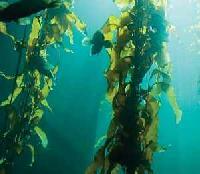 Because of the mineral-rich environment of the sea, kelp provides the broadest range of minerals of any food. Kelp is an excellent source of vitamin K, and provides the B vitamins folate, riboflavin, and pantothenic acid. People who eat kelp have been found to have a lower risk of intestinal and breast cancers. Sea vegetables are an excellent source of iodine, necessary to healthy thyroid function and the prevention of goiter. If you have stopped using ordinary iodized table salt, you may wish to add sea vegetables to your meals to provide this essential mineral. You can even keep a container of kelp flakes on the dinner table and use it instead of table salt for seasoning foods. Three and one-half ounces of raw kelp provides 43 calories, 9.6 g carbohydrate, 1.7 g protein, 0.6 g fat, 1.3 g dietary fiber, 116 IU vitamin A, 3 mg vitamin C, 180 mcg folic acid, 89 mg potassium, 42 mg phosphorus, 233 mg sodium, 168 mg calcium, 2.85 mg iron, 121 mg magnesium, and 1.23 mg zinc. Leeks are popular in traditional European foods because these plants, close relatives of onions and garlic, could be left in the ground during the winter and harvested as needed, providing a rare source of fresh winter produce. The Allium family, to which leeks, garlic, and onions belong, have long been recognized for their cardiovascular benefits. Allicin, the compound that gives these vegetables their characteristic aromas, has antibacterial and anti-fungal properties, is an anti-inflammatory, and may help reduce fat deposits and hardening in blood vessels. Allicin breaks down into components that appear to be strong antioxidants. A diet rich in Alliums tends to lower both blood pressure and low-density lipoprotein (LDL), or �bad� cholesterol, reducing the risk of heart disease and stroke. Leeks are a very good source of manganese and a good source of vitamin B6, folate, vitamin C, and iron. This combination of nutrients helps stabilize blood sugar by slowing the absorption of sugars in the digestive tract and assisting in proper sugar metabolism. Leeks are among the vegetables that contain measurable amounts of oxalates, which can cause problems for people with kidney disease, gout, rheumatoid arthritis, vulvar pain, or other conditions requiring a low-oxalate diet. One-half cup of cooked chopped leeks provides 16 calories, 4 g carbohydrate, 0.4 g protein, 0.2 g fat, 0.6 g dietary fiber, 25 IU vitamin A, 2 mg vitamin C, 12 mcg folic acid, 46 mg potassium, 6 mg sodium, 8 mg phosphorus, 16 mg calcium, and 8 mg magnesium. Almost all of the lettuces are low in calories and high in fiber, and provide vitamins A, C, and K; B vitamins thiamine, niacin, pantothenic acid, and folate; carotenes, including beta-carotene, lutein, and zeaxanthin; and the minerals manganese, potassium, and iron. The traditional iceberg lettuce is the least nutrient-dense of the lettuces. Romaine is probably the richest nutrient source among them; it is an excellent source of vitamins A, C, and folate, as well as the minerals manganese and chromium. It also provides vitamins B1 and B2, potassium, molybdenum, iron, and phosphorus. Many of the leaf lettuces offer nearly as good a nutrient profile as romaine, so you don�t need to give up variety. The mix of minerals, fiber, and antioxidants in romaine help it lower blood cholesterol and reduce the formation of fatty plaques in arteries. The potassium and other minerals help lower blood pressure, and the B vitamins help support and increase your metabolism. One cup of shredded raw romaine provides 8 calories, 1.4 g carbohydrate, 1 g protein, 0.2 g fat, 1 g dietary fiber, 1456 IU vitamin A, 14 mg vitamin C, 76 mcg folic acid, 162 mg potassium, 4 mg sodium, 26 mg phosphorus, 20 mg calcium, and 4 mg magnesium.